The Internet opens up the entire world and removes constraints traditionally dictated by well-entrenched industries. A global audience and market is just on the other side of your keyboard. We live in a time when extra income and financial security is more important than ever. Blogging and publishing great information as eBooks is legitimate, enjoyable, and profitable. 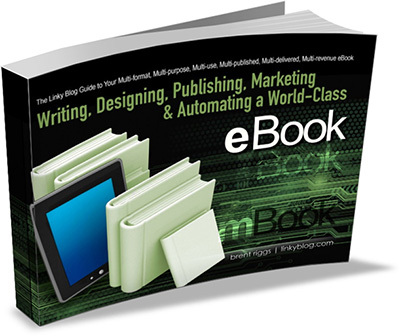 In the guide, I teach you about writing an eBook and then publishing it, marketing it and selling it in multiple formats. This is not theory... I’ve done it more than a dozen times. eBook: the common term for a publication usually created as Word document, saved as a PDF document, and then electronically delivered. The Xerox effect is in full force: copies of copies of copies. Same old, same old… yawn. And most of them have one eBook: the one they published on how to publish an eBook. Not exactly a wealth of experience. This duplication of material by dozens of bloggers exposes a lot of inexperience and a lack of knowledge about what is possible when you self-publish your great content in electronic or print form. There’s a lot more to an “eBook” than just a PDF download. I’d like to see the term “eBook” evolve into something more accurate. That phrase is the simplest way I can describe a more full-featured and useful approach to self-publishing. You write the content one time but you publish it in a variety of formats. While there are other formats, I believe the three most popular and productive are 1) electronic/PDF, what we now call an “eBook”; 2) actual printed hardcopies or paperback versions using on-demand print services; and 3) publishing to Kindle (which is the reading device promoted and used by Amazon (you can also take the Kindle concepts that are discussed in this guide and apply them to Barnes & Noble and the Nook device - which is similar to the Kindle but not nearly as popular). When I talk to people about books, I commonly hear responses like "I'm not an author" or "I have no idea how to write a book." That does not matter. You can hire people to help you write, design, and lay out your book, as well as proof and edit it. It is the finished product that matters, not whether or not you did all the work yourself. There is a healthy selection of good software, services, and contractors that can help you produce a high-quality mBook. We'll get more into the details later but for now I want to tell you why every blogger and online business person should have an mBook. Without trying to explain the obvious, there’s just something about having a published book that gives you credibility. It implies you are knowledgeable about your industry or topic. It sends a message that you are an expert or an authority regarding the subject matter. It sends a message of confidence to your audience. Publishing makes most people think "wow, you've got a book. You must be somebody." You can quickly ruin that impression by publishing a crummy book, but the fact that you have a book gives you a head start and leg-up within your niche or online community that others do not have. It is becoming the norm that if you promote yourself as an expert or authority, you will have some sort of published proof of it. An mBook meets the expectation that you have quantified and defined your expertise in written form - proving you know your stuff. In the online business and blogging world, an mBook is something people automatically look for and expect from “guru” or “expert.” Do not disappoint them. An mBook is a perfect thing to give away, sell, or promote. It is an excellent way to market your online business, blog, expertise, and knowledge. What is really cool is that inside your mBook you get to continue to market yourself, your blogs, and your other products. The mBook itself is an advertisement for you and your online business. Within your mBook, you have the opportunity to further market other parts of your business. It's like having your own little mini-advertising agency. An mBook is a perfect incentive to offer to new subscribers to your blog, or as an enticement to open the doors of opportunity with your audience. A well-done mBook (given as an incentive) provides value to your readers and can be traded with potential audience members for things you want from them such as an email subscription, survey participation, or some other kind of audience engagement.